Did I leave any adjectives out of the headline? I probably could have found a few more, but headline spacing held me back. I know it’s the first game, and we’re all prone to overreaction in Week One. But this was bad. The question now is, was this just one game, one really bad game? Or is this just the first example of what this season is going to look like for the next 15 games? I’ve been around long enough to never assume that what happens in the opener tells the story of the season. Wade Phillips 1998 team that started 0-3 and finished 10-6 is my reminder for that. But everything any of us feared about 2018 came true in Baltimore. Bad and over matched QB play, a sieve of an offensive line, receivers who can’t get open, a lack of pass rush, a big question at cornerback, non-athletic linebackers and an overall lack of talent. That’s not overreacting to one game. That’s the first cough in a season long flu. 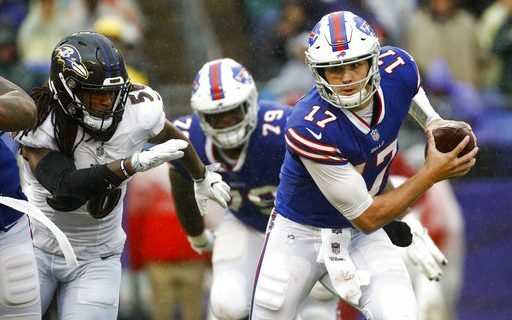 The only thing slightly positive about this game was the debut of Josh Allen. Not for how he played. But for the fact that he DID play. It’s earlier than anyone expected. But the good news is, it may force Sean McDermott to do what we all knew he would at some point. That’s turn this team over to Allen and let him learn. The decision of when was always based on Nathan Peterman’s performance. How long could he play well enough to hold off Allen? The answer is….just over a half. Peterman is not an NFL starting quarterback. I feared that was the case last season, but I was willing to give him a chance. I’m done with that now. He’s a fifth round draft pick with a subpar arm. Tell me that’s not exactly what he looked like Sunday. He’s just not good enough. Maybe with a great line and top flight receivers. But now when he has the carry an offense. So unless McDermott is hell-bent on keeping Allen on the bench to watch, we should be done with Peterman as the Bills starter. The future is now. Allen needs to start next week against the Chargers. *Could Kelvin Benjamin look more disinterested than he did Sunday? I noticed it when he didn’t seem to run hard after a deep throw in the first half. It was confirmed for me when he dropped a few other passes later in the game. The Bills need so much of him, that it was painful to see him play down to the level of the rest of the receivers. Who, by the way, were exactly the mediocre players we thought they were. *Allen showed his strong arm, and flashed just enough to be excited about his future. But he continued to do the same two things he did the preseason that prevented him from winning the job. He was too quick to run, instead of staying in the pocket and finding receivers. It’s nice that he can run and make something out of nothing. But he’ll never be successful until that habit is broken. He also continues to be indecisive. Allen was sacked three times, and they were not all the O-Line’s fault. Allen has to start to trust his eyes and the scheme and not just wait for a receiver to be wide open. Now, the receivers and tight ends have to make that happen too. *The offensive line is bad. To think the Bills could replace two high-end starters with their backups is ludicrous. Throw in a career back in Vlad Ducasse who shouldn’t be starting anyway, and it’s backups inside and no holes to run. Take away Lesean McCoy’s 12 yard run which he bounced outside, and the Bills best weapon had 10 yards on 6 carries. *The Ravens clearly had a plan to take advantage of the Bills aggressiveness on defense. It seemed to me that nearly every play had some form of misdirection, play-action, bootleg or some other kind of window dressing. *Vontae Davis was a surprise inactive. I assume it was related to his groin injury. But Phillip Gaines didn’t do much to make me feel like the position is in good hands. *Player of the Game? Punter Corey Bojorquez averaged 49.6 yards per punt. Yes, he dropped the one punt, but the weather and rain had something to do with that. It looks like the Bills beat the Patriots at their own game in trying to hide him.